Declare labels are issued to products disclosing ingredient inventory, sourcing and end of life options. Declare labels are based on the Manufacturers Guide to Declare, administered by the International Living Future Institute. Material ingredients are inventoried and screened against the Living Building Challenge (LBC) Red List which represents the ‘worst in class’ materials, chemicals, and elements known to pose serious risks to human health and the greater ecosystem. The HPD Open Standard provides a consistent, and transparent format to accurately disclose the material contents and associated hazard classifications for a building product. Screening lists, which include chemicals that government bodies determined need further scrutiny, as well as chemical lists not recognized by any government body. The Declare product database and label are used to select products that meet the LBC's stringent materials requirements, streamlining the materials specification and certification process. LBC Red List Free This product does not contain any ingredients on the LBC Red List. LBC Compliant This product meets the requirements of the LBC Red List Imperative due to a temporary exception. Declared This product has voluntarily self-disclosed all ingredients in order to promote transparency. Click the label to see the full declaration. List Translator Likely Benchmark 1 / Benchmark 1An LT-1 chemical score is based on lists that identify it as a Chemical of High Concern. List Translator Possible Benchmark 1An LT-P1 chemical score translates to Possible BM1 and reflects the presence of the chemical on Screening A or B lists and some uncertainty about the classification for key endpoints. Further research is needed on the flagged endpoint to determine if the chemical is indeed a GreenScreen Benchmark 1. List Translator Benchmark UnknownAn LT-U chemical score indicates that there is insufficient information to apply the GreenScreen Benchmark Scoring algorithm to the chemical. That can be a good sign. Typically, only hazardous chemicals are found on hazard lists. However, lack of presence on hazard lists can also mean that the chemical has not been well tested. A full GreenScreen assessment will need to be performed to determine if a chemical is a Benchmark 2, 3 or 4. No GS data availableNo data available on List Translator lists. Total Volatile Organic Compound (VOC) content for liquid/wet applied products. VOCs get released into the air as the wet applied products dry. VOCs can cause acute symptoms, including headaches and dizziness. VOC Content data is not applicable for this product category. 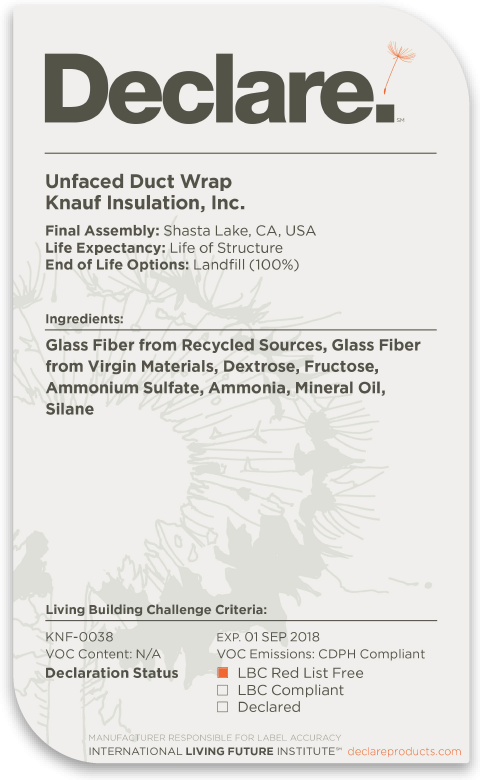 The base fibers of both Atmosphere™ Duct Wrap and KN Utility Insulation have no Red List chemicals. The Red List is a list of chemicals that are not allowed in Living Building Challenge buildings. Being Red List free is our design benchmark at Knauf. Because of stringent fire performance requirements for this class of product, fire retardants are used in the foil scrim kraft (FSK) product variant. Those fire retardants are on the Red List. A health product declaration (HPD) is provided for the FSK variant. 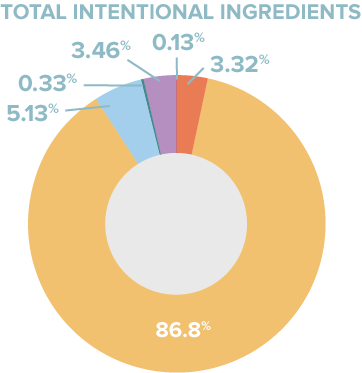 The ingredients of the unfaced variants avoid the 800+ chemicals of the Living Building Challenge Red List. This is primarily because of its bio-based binder adhesive chemistry known as ECOSE® Technology. ECOSE is based on dextrose or high fructose corn syrup instead of phenol and formaldehyde. Dextrose and fructose can be used interchangeably. The ECOSE binder allows the product to be validated by the UL Environment as formaldehyde-free. Formaldehyde is a Red List chemical. Atmosphere Duct Wrap with the FSK facer does not meet Red List free status because the facer contains a halogenated fire retardant (HFR). This is why we disclose the ingredients as an HPD rather than Declare used for all other product variants. Red List free is our development benchmark and we constantly challenge ourselves on elimination of Red List chemicals. An HFR is used on the FSK variant because the product is for exposed applications and must meet stringent fire performance requirements. We are very aware of the concerns associated with HFRs and continually work with vendors on this issue. At the same time, fire performance is critical and current events relating to fire performance of building materials only support the importance of fire-safe products. Knauf led the industry in bio-based development to avoid phenol and formaldehyde in our processes beginning in 2008. This development was likely the largest green chemistry disruption of our era. Today, our competitors have followed or are striving to meet this benchmark. The primary ingredient in this product is recycled glass. While recycled content may vary from year to year, the recycled content is currently greater than 60% by weight. The second largest content is silica sand which is sourced as locally as possible. The third largest ingredient is corn-based syrup (dextrose or fructose). As a result of using plant-based binders, the VOC profile of this product is very interior friendly. The emission from our factories is also much better for our communities. We ensure our glass formulations have no serious health concerns by allowing our processes to be audited to meet European Certification Board for Mineral Wool Products (EUCEB) biosolubility requirements. At this time, the product is landfilled at end of life. We take extended producer responsibility very seriously and have active programs to address end of life. There is no option other than landfills at this time. Knauf engages very closely with its vendors to eliminate and avoid chemicals of concern. No competitor has as many Red List free products as Knauf Insulation. We continually reduce our environmental impacts through recycled content and optimize our products by designing them to be transformative. A comprehensive guide providing information about the program, the assessment methodology, how to submit material data to obtain a Declare label and how they are used to meet the Health & Happiness and Materials Petals of the Living Building Challenge. Health Product Declaration Open Standard v2.1 The standard provides guidance to accurately disclose the material contents of a building product using a standard, consistent, and transparent format.